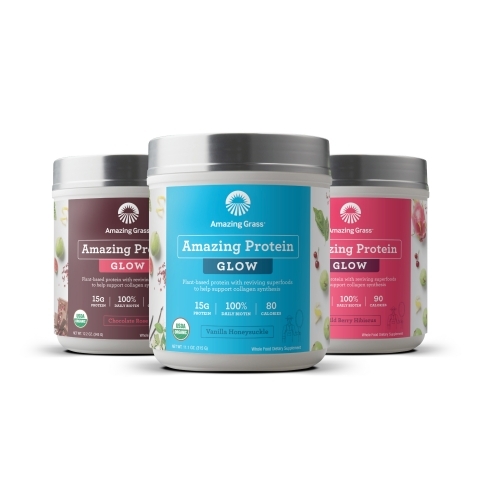 NEWPORT BEACH, Calif.--(BUSINESS WIRE)--Amazing Grass™, the nation’s leading brand of plant-based, whole-food powdered supplements and nutrition bars, just launched Amazing Protein Glow, a revolutionary new product line featuring the brand’s signature farm-fresh greens, organically grown on its family farm in Kansas, plus an array of functional botanicals to support a natural glow from the inside out. The innovative supplement, with 100% active ingredients derived from plants, delivers a plant-based solution to the collagen boom, providing a thoughtful combination of nourishing protein, reviving superfoods and an excellent source of key vitamins to support collagen synthesis for healthy skin and a natural glow, while remaining entirely animal-free. Consistent with all Amazing Grass products, Amazing Protein Glow is USDA Certified Organic, non-GMO, gluten-free and vegan-friendly. Amazing Grass products are available nationally at major natural food retailers, including Whole Foods Market, Vitamin Shoppe, Target, GNC, Sprouts, and online at AmazingGrass.com, Amazon.com and more. For more information on Amazing Grass and its line of plant-based, whole-food nutrition, please visit www.amazinggrass.com. Amazing Grass was created in 2002 to help people connect health, nutrition and the environment to lead more active lives through organic, plant-based nutrition. For more than 50 years, its family farm in Kansas has perfected the growing, harvesting and dehydration of organic greens to ensure optimal nutrition. Today, the brand thoughtfully combines its alkalizing greens with the highest quality plant-based ingredients and superfoods sustainably sourced from around the world. All Amazing Grass products are plant-based, non-GMO, and made with real, whole-food ingredients. Amazing Grass is designed for people who conveniently want to get the recommended daily servings of fruits and vegetables, cleanse and detoxify, have digestive issues, and/or are vegan or consuming a vegetarian diet. Follow Amazing Grass via Facebook, Twitter, Instagram and Pinterest to learn more.